Here's the perfect thing to go with your beer bread. This flavorful tummy warmer was another big hit at my Cozy Breads & Soups cooking class. It's quick and easy to put together, yet it tastes as if it's been simmering on the stove for hours. Start the soup, then mix up the beer bread batter while it comes to a boil, and in a little over an hour you'll be serving up cold weather comfort food at its best. Add a bag of organic baby spinach tossed with your favorite dressing (or try my Lower Fat Homemade Buttermilk Ranch Dressing) and an Emergency Chocolate Cake, and casual weeknight entertaining is suddenly a snap. Is everyone coming over to your place to watch the big game on Sunday? This recipe, which tastes even better after a day or two in the fridge, can easily be doubled, and it's hardly any more work to make two batches of beer bread (perhaps different flavors?) than it is to make one. Simply reheat the soup while the beer bread bakes, and you can effortlessly feed a crowd without missing a minute of the fun. The nice thing about lentil soup is that it's very accommodating. You can make it with just about anything, and it's always tasty and satisfying. It happily adapts itself to whatever ingredients you have on hand, freezes beautifully, and can even be eaten cold. It's also cheap to make. Leftover lentil soup makes a lip-smacking lunch, whether consumed after a morning spent stacking firewood or slaving away in a cubicle. This stew-like version takes advantage of the winter pantry by using canned tomatoes, onion, garlic, and carrots. Packed with nutrients and fiber, it'll fill you up and keep you going. Consider trying a bowl for breakfast. Use whatever types of lentils and sausage strike your fancy. and this fully-cooked, smoked kielbasa made by our local meat processor. Sausages vary widely from region to region (and even from town to town), so feel free to experiment. 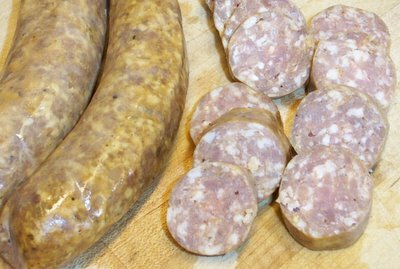 I once bought kielbasa from another nearby meat processor to use in this recipe, and it turned out to be an uncooked sausage that looked like what I call Italian sausage. The resulting soup was delicious. You can also omit the sausage altogether for a vegetarian version. As always, I encourage you to seek out local and organic ingredients. They really do make a difference. Organic carrots and onions are year round best buys and can be found in many supermarkets. Are you a garlic lover? Look for interesting varieties of organic garlic—as well as other locally produced foods—at your local farmers' market. 1. Heat 1 Tablespoon of the olive oil in a medium pot. Add the kielbasa and cook over medium heat until nicely browned, about 2 to 3 minutes per side. Remove from pot and set aside. When cool, slice rounds in half and set aside. 2. Add the onion and carrots to the pot, adding up to 1 Tablespoon of olive oil if necessary to prevent sticking. Cook 5 minutes over medium heat, stirring so that the vegetables are coated with the caramelized bits left in the pot from cooking the sausage. Add the garlic and cook 1 to 2 more minutes. 3. Add the water, lentils, and tomatoes and bring to a boil. Reduce heat and simmer, with the lid cracked, 20 minutes, stirring occasionally. 4. Stir in the parsley, cumin, paprika, salt, and red pepper flakes if desired. Simmer, with the lid cracked, an additional 30 minutes, stirring occasionally. 5. Carefully purée about half of the soup in a blender on low speed until still slightly chunky, then return to the pot. Or use an immersion hand blender to purée the soup to desired consistency. (I love my KitchenAid hand blender; it may be the best $50 I've ever spent in the kitchen.) Stir in the sausage. Cook over medium heat 5 minutes. Serve hot, garnished with chopped fresh parsley if desired. How about some bread to go with your soup? © Copyright 2005 FarmgirlFare.com, the tummy warming foodie farm blog where Farmgirl Susan shares recipes, stories, and photos from her crazy country life on 240 remote Missouri acres. Love to do something with lentils. Yum. This looks like my kind of supper. That kielbasa looks outstanding, too. I have noticed that soup, more than other food types, is particularly unphotogenic. It looks so appealing in person, but somehow I can never capture that. Yours actually looks very appetizing,particularly compared to my attempts, which generally appear either murky or lurid. I'm not much of a photographer, but find most food sort of sells itself, picture wise. Not so soup. Of course, I am also amazed by the ability of so many bloggers to capture their cats in a still moment. Thus far, most of my cat pictures are a blur. The most recent on of my young kitten, Ms. Sydney, make her look like she has 2 noses. So with your great supply of lamb, do you ever make sausage? There's an insanely easy non-cured sausage recipe, really delish, in Jacques and Julia's book. I *heart* lentils. Why do they get such a bad rap? They are so filling and take on flavor so well. I agree with Lindy, too--my soup photos are horrible! But yours always turn out so nicely. This does look spectacular. I agree with Lindy, soup must be the hardest thing in the world to get a good photo. I also agree about the Muir Glen tomatoes, they are by far the best canned tomatoes I've had. I am bookmarking the recipe. I'm going to make this for sure. Great looking soup! It's only in the 50s here in Texas, but that's cold enough for this soup. yummmmm. 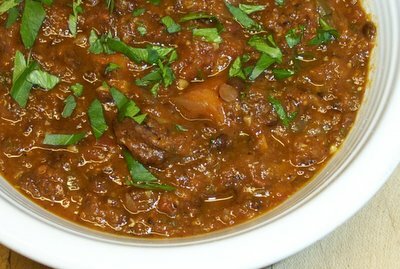 i love thick hearty lentil soups. i usually put some dijon mustard in mine, but cumin? it has possibilities. yummy! I'll try the veggie version with my whole wheat beer bread. Thanks for sharing the recipes. Yummy. I was just scrambling thhrough my recipe box trying to find this and couldn't so here I am. It's an awesome recipe that my whole family (ages 1, 4, 5, 34, and 48) will eat happily. I'm eyeing the Kale in the backyard thinking that it might find its' way into the pot too. Thank-you for such a lovely recipe. This has got to be the BEST soup I've ever tasted! And believe me, I'm fussy about my soup. I made it with some canned tomatoes that I got from my cousin, and used chicken sausage that was in the freezer, and thinned it out some with a half bottle of Bloody Mary Mix. Talk about FLAVOR! It just dances on the tongue. Thank you! I've been passing this recipe along frantically to anyone who wants it. I hope you don't mind. It's wonderful! I found your wonderful site after searching for a hearty lentil stew recipe. It has been snowing here in London and this stew was exactly what we were hoping to create! 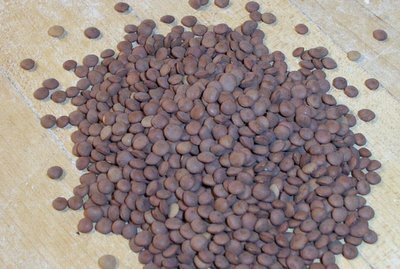 I used puy lentils, along with some Polish kielbasa we purchased at Borough Market and it.was.DELICIOUS and nutritious! We are from California too, and all we ever do is fantasize about the day we can settle somewhere bucolic, live in a yurt, grow our own fruits and veg and have chickens running around! I saved this recipe a year ago and finally made it last night. Thanks so much for the perfect hearty winter soup recipe! This is one of those recipes that I go back to again and again. Everyone who ever has it just loves it. I'll use whatever sausage is on sale at the butcher, tweak the spices ever so slightly and it always turns out so deliciously. Thank you for this. Yum! Just came across this lovely recipe and am going to try it out today! Looks as if it's going to be absolutely delicious! Many thanks! this soup is delicious! i've added a few handfulls of swiss chard at the same time as the parsley for more vitamins. yummmmmmmm, thank you! Found this recipe a few weeks and just HAD to make it. This past weekend we were stuck indoors due to the weather, so I made a double batch. Wonderful...even hubby raved about it. Served it with a cornbread cooked in an iron skillet, snow was falling outside and temp was 9 degrees. Does it get much better? I just made this today, using Lightlife vegetarian smoked sausage, and it was fabulous! I added a teaspoon of smoked paprika (to give it a bit more earthiness) and some celery (because I had some wilting in the fridge). The husband had seconds and says that he's looking forward to the leftovers. This recipe is a keeper, for sure. Thanks! I'm doctoring this up as I write--not using lentils, but navy beans I soaked overnight and are now in the crockpot to fully cook. Anyway, I'm making it with lamb andouille from (oddly) the farmer I buy my pork from. Girl, what do you mean? Your lentil soup looks gorgeous! I LOVE your blog and I love your pictorial salute to 2010. You have a beautiful life. Thanks for sharing it with us in suburbia. Enjoy the farm life for those of us who are resolved to be farmgirls at heart! Thanks for all the inspiration you give me. My husband is on an extreme low-sodium diet (500mg/day) and it has been challenging to find dishes that satisfy the tastebuds while keeping each meal around 100mg. Thank you so much for posting this recipe. It was quite easy to modify and was packed with tons of flavor. Instead of the sausage, I used organic dry-smoked turkey, no-salt added tomatoes, and omitted the salt. Topped with a dollop of sour cream this was delicious and only 67mg! Thank you for a wonderful recipe that made my husband smile. I stumbled upon your blog this afternoon and was fortunate enough to have ALL of the ingredients for this recipe. It's on the stove right now. I can't wait to try it. Love your blog!! Thank you again for sharing your great recipes, FarmGirl Susan! The HKC kitties, dogs, and chikinz say "hi." This soup is FABULOUS! I think it looks delicious. The immersion blender makes it perfect. I only left the sausage and carrots whole. I loved this so much.